Whether used as an adornment or for teething, you’re considering necklaces for your baby. However, are necklaces effective and safe? What are the risks? Let’s admit it. When babies are teething they can become drooling, fussy monsters. It’s also difficult seeing your baby suffer during this period. That is why alternative treatments, such as teething necklaces, are a popular way of easing symptoms. Necklaces for babies can be made of wood, amber, marble, or silicone. Many parents swear by it and most claim that it relieves teething pain and even offers sensory stimulation for infants. However, there are some safety considerations you should be aware of. In this article, will talk about important info you’ll need about teething necklace safety. You may have heard of Baltic Amber necklaces, or you’ve seen other babies wear them. If you’re curious about these orange beads, they’re not just a fashion statement. They are actually a homeopathic teething remedy! Most of the usual treatments for teething are synthetic gels, tablets, toys, or biscuits. These methods need to be applied multiple times. When your baby drops their teething toy, you’ll have to pick it up and hand it to them again. And this scenario happens many times within the day. However, one upside of necklaces is that they simply need to wear it to enjoy the benefits of amber necklaces. But what makes amber teething necklaces work? Amber is a natural analgesic. It contains succinic acid which helps fight inflammation, fever, and infections. When amber is placed on your baby’s skin, their warmth releases oils which are absorbed by their skin into the bloodstream. Recent scientific research finds that succinic acid’s benefits include stimulating the thyroid glands. This reduces drooling and produces a calming effect. Many believe that the use of amber to help soothe and alleviate teething symptoms is a new fad. However, this remedy has been around for hundreds–possibly thousands–of years in parts of Europe and Asia. You’ll even find them being sold in local pharmacies around Switzerland, Germany, and Austria! Necklaces are potentially dangerous mainly because of choking and strangulation. When your child breaks the necklace, they may swallow and choke on the beads. Their necklaces may also catch on something which can potentially strangle them. What Age Can You Use An Amber Teething Necklace? 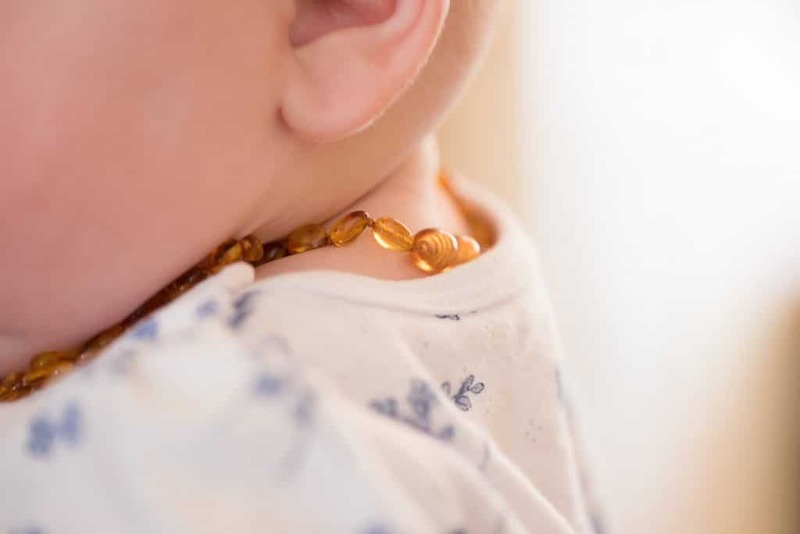 So, what is the safest age for babies to wear amber teething necklaces? Babies between 2 months to 3 years of age can benefit from them the most as they’re teething during this period. However, you can get your baby used to wearing an amber necklace earlier. This way, they’ll get used to having them on and pay less attention to them–without pulling or biting on the beads. Check out this essential necklace safety checklist. See what you need to know for when baby is wearing a teething necklace. First of all, keep your eyes on your child while they wear a necklace. Instead of their neck, consider having them wear it on the wrist or ankle. During sleep or bedtime, remove your baby’s necklace. Necklaces are meant to be worn and not chewed. Wondering what type of necklace is the safest for your baby? Every bead should be double-looped and notted on each of its sides. Check to see whether the clasp is simple. Pick a necklace with beads that are smaller. Avoid necklaces that use amber chips. If beads are securely lopped and notted, it’s less likely for them to come loose and be swalllowed. This ensure that the necklaces is less of a choking hazard. A simpler clasp that isn’t too complicated or strong will break under pressure. This is good as it minimizes the danger of strangulation. When your baby’s necklaces happens to be pulled or snagged on an object, it will break free. Smaller beads are also preferable. When beads are small, your baby is less likely to choke on them. Avoid necklaces made of amber chips. The irregular shape in amber chips can be sharp and break the skin, causing scratches or wounds. It can also feel uncomfortable against the skin. Searching for safe necklaces for babies? Look no further. We’ve compiled a list of The Top 5 Best Teething Necklaces in our complete review. As parents, we are responsible for the safety and wellbeing of our children. You shouldn’t feel guilty for going the extra mile to ensure your baby’s safety. Always supervise your child when they are wearing a necklace and remove it when they go to sleep. Unlike other baby products, teething necklaces are not regulated by the FDA. Make sure that you purchase only from trusted and established sellers with good reviews.